Are your retirement savings on track for your age? Making sure you have saved enough for retirement should be a top financial goal across all age groups, but many people still don’t know how much they should have saved at every age. 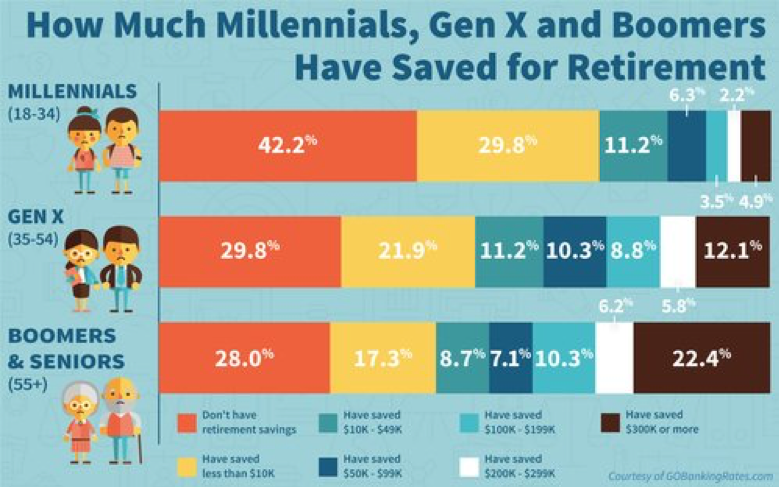 A recent GoBanking.com survey of Millennials, Gen X’ers, Boomers, and Seniors found that a significant percentage of Americans in every age group had less than $10k in savings for retirement. 28% of Boomers and Seniors have no savings at all. Experts agree that establishing set retirement savings goals by age is the best way to make sure you will have enough saved by the time you want to retire. 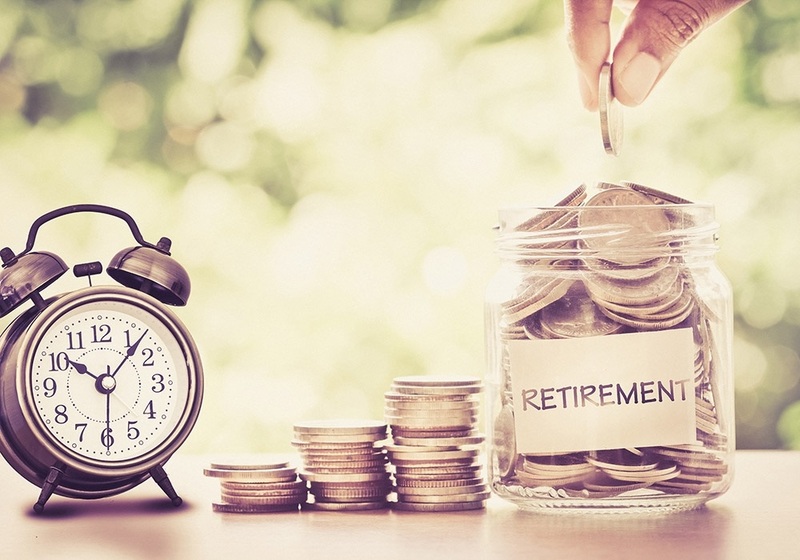 Estimates vary on the exact amount you need to have saved to retire, depending on the lifestyle you want and the age at which you plan to stop working. If you are planning to have a modest lifestyle and expect to keep working until age 70, you can retire with just 8x your annual salary in savings. If you want to travel frequently and plan to retire at age 65, having 12x your salary in savings would be a more prudent decision. Fidelity Investments splits the difference, recommending you should have 10x your annual salary in savings by age 67. Working from that figure, let’s take a look at your recommended retirement savings by age group. Your savings goal by age 30 should be to have one times your annual salary put aside for retirement. Because of the way that compound interest works, skipping out on saving in your twenties could leave you with a retirement shortfall that will take twice as long to make up in your thirties and forties. If you start saving at age 25, you will only need to put away 15% of your salary to meet your retirement savings goals. Prudent retirement savings goals for your thirties call for having two times your salary saved by age 35 and three times your salary saved by the time you are 40 years old. For instance, if your annual salary is $100,000, you should have $300,000 in savings by the time you reach age 40. If you are just beginning to save for retirement in your 30s, you will need to put away a higher percentage of your salary to get your retirement fund back on track. If you start saving at age 30, you should put away 18% of your pay; delaying saving until age 35 means you will need to save 23% of your annual salary to make sure you reach your retirement goals. Four times your salary is the recommended retirement milestone to reach by age 45, and six times your salary by age 50. Shifting the investment mix in your portfolio can make a big difference when it comes to meeting your retirement savings goals. A skilled financial planner can help you select age-appropriate investments that will help you meet your savings goals while maintaining your desired risk profile. The recommended retirement savings by age 55 is seven time your salary, and it is eight times by age 60. If you haven’t reached your retirement milestones by age 50, you can make catch-up contributions to your retirement saving plan to avoid a shortfall. You can contribute an extra $6,000 over the $18,000 limit on your 401(k), 403(b), or other employer-sponsored savings plans for a total of $24,000 in 2017. You can also contribute an extra $1,000 to your IRA for a total of $6,500 in 2017. If you have met all your retirement milestones, by age 65 you will have eight times your salary in savings and ten times by age 67. If you haven’t achieved your retirement savings goal by age 67, you may need to delay your retirement and keep working until you are 70 years of age or even older. Setting specific retirement and savings goals by age group is the best way to ensure you are able to retire at your desired age and enjoy the lifestyle you prefer. If you would like help creating a retirement savings plan or adjusting your current one to ensure you can enjoy the retirement lifestyle of your choice, reach out to skilled financial planner Matt Logan today at www.MattLoganInc.com.